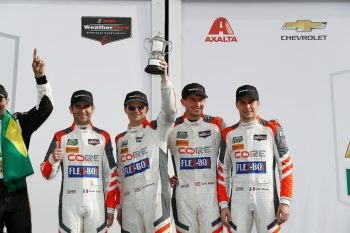 CORE autosport will have the chance to go for an overall IMSA WeatherTech SportsCar Championship Prototype title in 2019. The team ran an LMP2-specification Oreca 07 Gibson in 2018 and came up only a few points shy of the title with Jon Bennett and Colin Braun. Braun and Bennett will continue into 2019 but now with a Nissan Onroak DPi, following a fairly last-minute acquisition. Romain Dumas (full Michelin Endurance Cup) and Loic Duval (Rolex 24 at Daytona) continue as well. The Patron ESM team ran a two-car Nissan program this year, before Patron announced its withdrawal from motorsports sponsorship. Morgan Brady, CORE COO, explained the process and change from the projected plan to continue with the Orecas into 2019.